AuthenticForum > AF Denim & Clothing > Seven for All Mankind Jeans > Official Seven Authentication Guide - Start Here with the Basics! 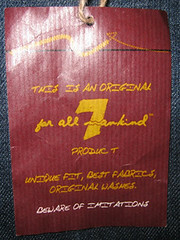 Seven for All Mankind Jeans All the tools to find authentic 7 for all Mankind Jeans within. In-depth guides, make sure you don't buy fake Seven. Official Seven Authentication Guide - Start Here with the Basics! SO…. How do you determine authenticity of Sevens?! Before jumping to the finer points of eyeing the jeans, the following warning signs will help you even if you don’t have the eye for picking out the reals yet. I do recommend though that if you have the ability in your area, go to a store that carries Sevens and inspect the washes, distressing, and tags closely so that you get an idea of what you are trying to match! 1)	Cut number – The cut number on Sevens is a batch number, like today’s batch might be numbered 723101, tomorrow’s 723102, etc. 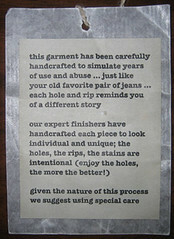 There are only a handful of jeans (maybe a few hundred) made with each cut number. 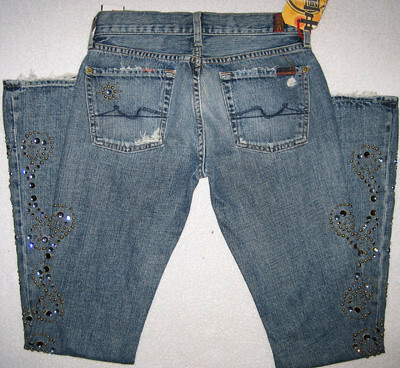 When counterfeiters get ahold of a pair to fake, they will take a real cut number and produce mass quantities of their jeans with it. After all, they are trying to make cheap junk… keeping costs cheap means not wasting resources changing the cut numbers constantly! As a result, now the market starts to see floods of jeans with the same cut number. These are known as “common fake cut numbers.” When these are identified, they are posted to the following website maintained by a super-cool chick named Bianca, and hence often referred to here as “Bianca’s Site” – Keine Chance den Fakes! . Bookmark this page. This is your bible. It is in German, and you will need to translate it at babelfish.altavista.com or google translator if you want to read the text, but even without translating or speaking German you can scan the list of numbers there for the one on the pair you’re looking at. If it’s on there, there’s a 99.9% chance that it’s fake. There ARE real pairs with those numbers, but they are like needles in a haystack. There ARE fake pairs that do NOT have one of the numbers on the list, so just because it is not on there does not guarantee it is real, but this is still a great starting point. -	Avoid items from sellers located in Turkey, China, Phillipines, Hong Kong, Bulgaria, any other obscure country. These are all counterfeiting hubs where there are no repercussions to this type of activity. 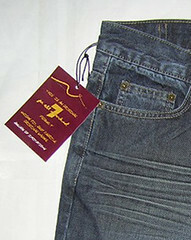 -	Seller is selling many pairs of brand new with tags jeans at dirt cheap buy-it-nows. Remember, if it seems too good to be true, it is. 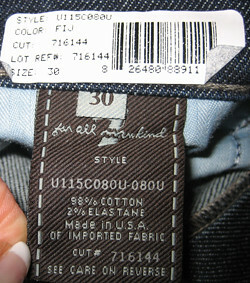 NWT jeans cannot be profited on at $40 a pop. -	Run a forum search for your potential seller’s ID. If any threads come up, read them… there are probably mentions of any major known fake seller, or any seller with a reputation for any other sketchy behavior, as well as known authentic sellers. There are many features of Sevens that can be used to determine authenticity. 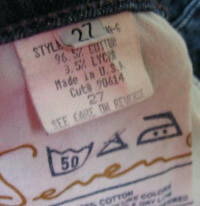 The most telling characteristic is generally the tag, which is why savvy Seven Shoppers will ask for a photo of it when evaluating a pair. The fakers just never seem to get anywhere close to right on this, and there are a number of common mistakes. OR - New for summer/fall 2007 brown main tag with white piping on the sides. Note that the font and printing are still IDENTICAL to the old tag, but the size tag is now WHITE and has a new font, the 3's on the new brown tag/white size tag combo are NOT FLAT AT THE TOP, they are now rounded. 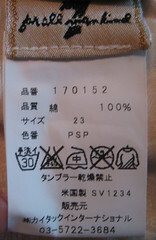 OR - 2009 and up, the brown tag similar to above WILL NOT have the cut and style number on it. These numbers are now located on a small white satiny tag underneath. Heck, you may even run into this rare and cool Japanese tag! Bottom: small yellow tag with 7FAM logo on front, and metallic looking security strip and etched serial numbers on the back. 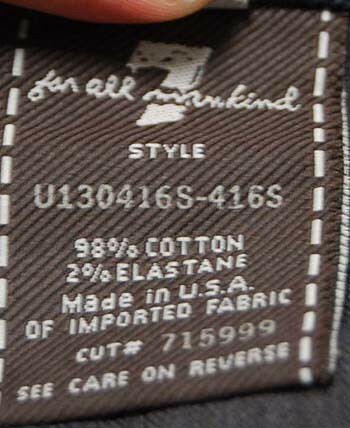 The security strip will reveal small black 7 For All Mankind logos printed throughout when viewed under magnification, or small red symbols on some newer pairs. New Sevens also come with a white barcode sticker. 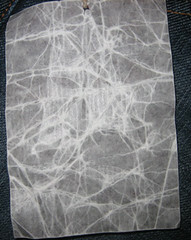 This tag is located INSIDE the jeans on the left front inner waistband above the tags. It should not be on the outside waistband. It should not be on the thigh. This can of course be moved by a store or buyer, but if you see a seller with multiple pairs with misplaced stickers, stay away. The sticker should also have rounded corners, not squared ones. 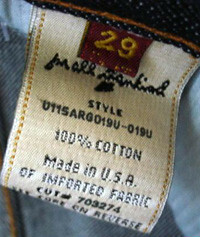 The cut and style numbers on a normal yellow tag are always PRINTED on the tag in an inked typeface. They are NEVER stitched. This holds true for pretty much every fake I’ve ever seen. Some look really close, but none are all there. Errors can include being too bold, too widespread, uneven spacing. Pay close attention to the number 2’s, these are the most easy to see discrepancies in. Sevens 2’s are curved at the bottom right as they approach the base horizontal line. They are not sharply pointed in the corner, nor do the diagonal and horizontal portions meet at a very small angle. Barcode sticker fonts are generally also incorrect on fakes. The easiest to identify is that the zeros should have slashes through them ( / ) . Any zero without a slash indicates a fake. 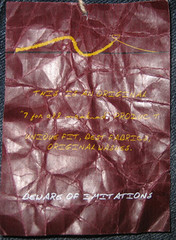 Note here on the real tags the 2’s have a gentle curve. 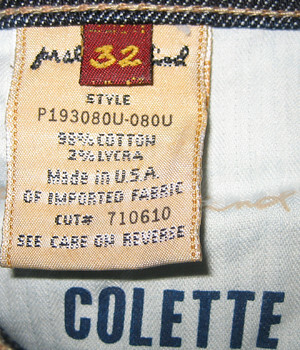 If you are a size 30+, you have an added bonus font error ON OLD STYLE TAGS WITH THE RED SIZE TAG. The 3 on the size tag should have a FLAT top line, not rounded. 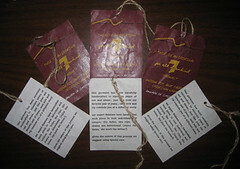 This 3 point does NOT APPLY to the new brown large tags which are paired with the new fonted white size tag. The 3 on the new white size tags IS NOT rounded. There are a few fakes of the white tag. These are so far easily identifiable, based on very poor font and overly glossy/flat, wrong material tag. RIVETS/BUTTONS – should be stamped with a 7 on the back. The rivets should never be raised/nippled or depressed on the inside surface, nor should the seven ever appear black/darkened. Note that this tag doesn’t have the 7 logo on the front side, and has NO writing on the back. This is off a pair of authentic US market Pink A’s, but also European market pairs (where they cannot use the names Seven or 7 due to legal issues) may use this tag. There is also a special hangtag for Great China Wall pairs. This tag is a thick cardboardy type tag, with a yellow background and black writing. On one side is "7 For All Mankind" and on the other is "Great China Wall." 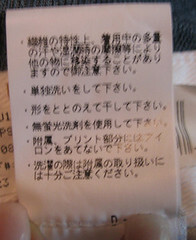 This tag is ALWAYS attached with a RED plastic slide-lock loop. The attachment is NEVER any other color. Many fakes are using white ones. A NOTE ABOUT EUROPEAN MARKET PAIRS - Some Sevens made for US sale, and ALL pairs made for the European market do NOT carry the word Seven or 7 anywhere on them due to legal issues. On these pairs you will find an inverted V known as the "pants logo" (looks like this - /\ ) on the back pocket red tag, inside yellow tag, back of rivets, and all rivets and the front of the button will read "for all mankind." These are not automatically fakes. These variants ARE now faked too though. OTHER IMPORTANT POINTS: Remember that Seven For All Mankind is NOT the same company or designers or affiliated in any way with Seven7. They do bear some similar markings and the obviously confusing name, which has resulted in much legal turmoil between the two. Seven7's are sold at Lane Bryant and Express among a few other locations, at much lower retail prices than 7FAM. 7FAM is sold at Nordstrom, Saks, Neimans, etc. for well over $100 (above $200 for the more ornate styles). A seller can say "Authentic Seven7" and be telling the absolute truth in their listing, but they AREN'T authentic 7FAM. Similarly, many sellers WILL claim that the item is 7FAM when it is really Seven7. Learn the ropes of Seven (tags, logos, etc) and you will not fall into this trap. Yay, the guide is here! Thanks for posting, Pam! Thanks for the guide Pam!! Thanks for bring this over Pam. BTW where is your A pocket list? Thank God you posted this here! I was kicking myself for not making a hard copy!!!! Thanks, Pam! I'm glad to see you're here, Pam...I'm still trying to figure out the navigation of this site, but I wanted to say hello! and glad you are here! Thank you! As a new member, I know I will find this very useful! Last edited by idalis; 07-13-2006 at 06:20 PM. I still find it very helpful and I don't consider myself a noobie anymore. Needless to say, I voted "Yes"
As a relative newbie who's only bought at Nordstrom - is there such a thing as purple pocket tags? 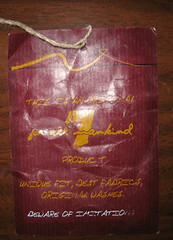 What about those yellow hang tags you see on the eBay jeans for sale? Just wondering if they are real? Visit my eBay Store - Super Vintage Nakita & Adara Liberty Print Roxannes in many sizes! Tons of mens & womens R&R, etc! LOL... I'm thinking now that you may have come here via my own auctions! I have 3 pairs of GCW's for sale, and the purple tags on them are the store's price tag. the purple I was talking about are the SFAM label on the back right hand pocket and above that on the waistband... do they ever come in purple? Great guide! Do you have anymore info on the European pairs? I just sold a pair on eBay. I bought them at Nordstrom, so I know they're real, but the European tags confused my buyer and now she thinks they're fake! LOL, post a link to your auction, and then send her here and we will tell her all about them. Basically the Euro pairs don't say "seven" or "7" ANYWHERE. So while it looks a little wacky, it's the way it's supposed to be. Last edited by idalis; 10-23-2006 at 08:50 PM. Thank you for this posting!! 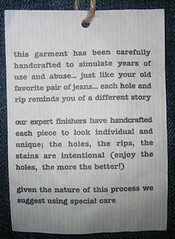 This really helped me with not buying "fake" seven jeans. I first read the article and then used what I had learned. It helped me find the authentic sevens!! Thank you again!! I was wondering how many different back patterns are there for 7FAM jeans out there because so far I saw 3 different back patterns on this site for them?! We have guides for 6 main pocket styles, there are also the regular squiggles that we don't have a guide for yet, there are some 'special' pockets within the regular guides, and at least 15 others aside from those. In short, A lot. 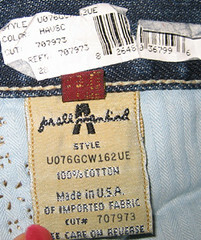 I heard that if the waistband says 7 for All Mankind, then ends with a TM instead of an 'R', it's fake. Is it true? I don't think that makes it fake... I remember reading about it. I need a pro to back me up though.